Leaving the scene of a property damage accident (sometimes written up as something like “leaving scene of PDA,” or “leave scene PDA,” and often referred to simply as “hit and run” or “PDA”) is one of the more common offenses I see in my role as a Michigan criminal and DUI lawyer. Most people don’t understand how seriously these cases are taken until they find themselves in the middle of one. The reason for this is simple: In many, (if not most) PDA cases, the driver who took off did so because he or she had been drinking and didn’t want to deal with the police and get arrested for a DUI. Of course, this isn’t true in all cases, but the assumption is nonetheless there in every case. Not surprisingly, a lot of these charges wind up in courts with robust DUI caseloads, including Oakland County’s Rochester Hills’ 52-3 and Troy’s 52-4 district courts, along with Royal Oak’s 44th district court. In Macomb County, the Sterling Heights 41-A district court and Shelby Township’s 41-A Shelby division, along with Clinton Townships 41-B and Roseville’s 39th district court see their fair share of PDA cases, while in Wayne County, the 16th district court in Livonia, the 18th district court in Westland, and the 35th district court in Plymouth/Canton deal with as many of these charges as any other local, Detroit-area court. As it often plays out, a person, while driving, sideswipes another vehicle, or else hits a parked car, a mailbox or some kind of road sign, and just keeps going. 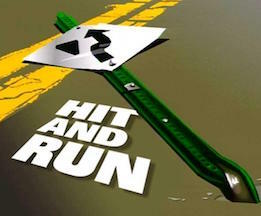 Many times, when a driver hits another vehicle in traffic, the license number of the vehicle that caused the contact is obtained, and later given to the police. Obviously, it’s easier to plow over a mailbox at 3 a.m. and go undetected than it is to hit another driver. Also, because alcohol is often involved, the offending driver may completely underestimate the degree of contact or amount of damage he or she caused. I’ve had cases that involved contact so slight that the person didn’t realize it and that resulted in an almost undetectable scratch, to cases where the driver beached the car somewhere after breaking off a wheel, left it, and went home, only to be roused by the police knocking at the front door. A key thing to remember is that a PDA situation is kind of like a bad DUI (at least in those cases where a person is unable to demonstrate that he or she was not drinking) specifically because there was an accident. Most drinking and driving arrests don’t involve an accident. In fact, in the vast majority of drunk driving cases, the person simply gets pulled over for something like speeding or swerving and then winds up getting caught after having had a few too many. A DUI with an accident is always worse than a simple DUI without one. When it’s believed a person charged with leaving the scene of a PDA had been drinking, it makes sense that he or she is seen as even more dangerous than someone merely stopped for drinking and driving without having hit anything. So what are consequences, as in punishment, for a PDA hit and run? A conviction for either a straight up DUI (technically called OWI, or “operating while intoxicated) or leaving the scene of a property damage accident will add 6 points to your driving record, and both theoretically carry a potential jail sentence: 93 days for a DUI, and 90 days for a PDA offense. The good news here is that jail is simply NOT on the menu, especially for a PDA case, so we won’t waste time talking about that. A key difference in consequences is that a DUI, even one that is reduced to the less-serious offense of impaired driving, carries a mandatory restriction of the driver’s license, whereas there is no such penalty in a PDA case. You get 6 points for a PDA offense, but no driver’s license sanction beyond that, while an impaired driving carries only 4 points, but does require your license to be restricted for 90 days. A conviction for OWI carries the same 6 points as one for PDA, but with the added grief that your license will be restricted for 5 months after spending 30-days with no driving whatsoever (this is called a “hard” suspension). One has to wonder, what are the other considerations, because, so far, going with the PDA seems like a no-brainer. For the most part, it is. In fact, unless a person already has too many points on his or her driving record so that the 2-point difference between a conviction for impaired driving versus either PDA or OWI is the difference between having 12 or more points or not, there is really no downside to going with the PDA and it’s non-alcohol related traffic offense. And this really brings us to the heart of the matter. As a general rule (and I’m hard-pressed to think of any exceptions), a non-alcohol related traffic conviction is always better than one which is alcohol-related. As the lawyer, however, the experience in handling a PDA case can be more aggravating than handling a DUI. For example, even in a crystal-clear drunk driving situation, a good lawyer can very often “plea bargain” the case down. This means that when a client is facing a charge of OWI, negotiating with the prosecutor to reduce it to the less severe “impaired driving” (OWVI) charge is usually possible. The same kind of plea bargaining often occurs even when a client is charged with a High BAC offense. In other words, as a lawyer, negotiating a plea bargain is far more the rule, rather than the exception. When the charge is leaving the scene of a PDA, however, things are different, and prosecutors are more reluctant, at least right out of the gate, to budge. In the first place, from the court and the prosecutor’s side of things, it looks like the person already go a kind of “plea bargain” just by avoiding the DUI. As I noted, it is assumed that, in the vast majority of cases, a person leaves the scene of an accident because he or she was drinking. In those circumstances where that’s not the case, I really have to go out of my way to prove it. One of the most common reasons given for driving off is that the person was “scared.” Sure, if a person all by him or herself runs into a van full of ornery bikers, there may be some legitimacy to the claim, but otherwise, you must stop after a collision, just like you must stop for a red light, and this is pounded into every new driver from day one of driving school. As a result, the “scared” defense isn’t really much of a defense at all. Moreover, anyone who could claim legitimate fear as a reason for taking off is not excused from either driving to a police station, or driving somewhere safe (like home) and then calling to report the accident. If the police come to someone’s house the next day and the person hasn’t at least called in about the accident, it doesn’t look good. In some cases, the police arrive at a person’s house within a short time after a PDA incident, only to smell alcohol on his or her breath. As stories go, the usual one here is that the person had not, of course, been drinking prior to driving, but did come into the house and only then consume some kind of alcoholic beverage. I suppose that when a person who has never been in this situation finds him or herself in it, these explanations don’t sound as unlikely or worn out as they do to the Judges, police and prosecutors who hear them all the time. While that may perhaps sound cold coming from a defense lawyer, NOT pointing this out is really a sign of inexperience. You hire a lawyer to help you and to avoid consequences, not move forward with a plan that’s doomed before it starts. With few exceptions, a lawyer who pushes this kind of story will be not be perceived as particularly astute by anyone, and especially not by the prosecutor or Judge. Instead, it’s often better to just remind everyone, where relevant, that assumption and presumption are one thing, but proof is quite another. I am reminded of a story told by a friend’s father, who was a career police officer. A retired cop moved “up north” somewhere. One day, he called his local police department because his wife was dead. When they showed up, they asked him what happened. According to the tale, he said, “I don’t know. You figure it out; you’re the detectives.” The details of this story are deliberately vague, but the take-away is crystal clear. Far better that a lawyer has the confidence and self respect to stand up for his client when it is implied the client was drinking and driving and point out that there is no proof of that than it is to offer a tired explanation that won’t be believed, anyway. This is particularly relevant as we circle back to plea bargains. As a lawyer, I go into a PDA case expecting to negotiate a better deal for my client. When the prosecutor quips that my client has already gotten a break by avoiding a DUI, I’m not going to make any headway by insulting his or her intelligence and using the “I was scared” explanation. Of course, there are cases where a person may not have been drinking, and/or there are other legitimate explanations for leaving, and in those cases, if I can satisfactorily demonstrate that, I will. In the usual case, however, I want to lessen the consequences my client faces, and beginning negotiations with a story that will only test the prosecutor’s patience, and which a seasoned lawyer should know better than to offer in the first place will be counter-productive. Instead, there are better strategies to still negotiate a plea bargain and spare the client a criminal conviction and some traffic point, even when it is assumed he or she has already escaped a DUI. Beyond all of that, of course, sits the Judge. Although constrained by law to sentence within the law, many Judges will not forget that, whatever the plea or plea bargain, a person who might have otherwise stood before him or her for sentencing on a DUI, by further disobeying the law, escaped that fate and now awaits sentencing on a much lesser charge. Here, the lawyer needs to do better than just “good.” To deflect any anger or frustration the Judge may have and to help redirect his or her focus, the lawyer needs to have exceptional communication and persuasive skills. As I hope this discussion has shown, there is a lot going on underneath the surface of any leaving the scene of a PDA case. If you’re facing this charge, you may be that very person who wasn’t drinking and did, in fact, “freak out” and just leave. Or not. Whatever else, the situation is serious enough to warrant proper legal help. Sure, I could hard-sell here and advise that, if you are facing this kind of charge in the Metro-Detroit area, you should call me, but the truth is that as much as you need a good lawyer, you need a good lawyer who is a good fit for you. The only way to find that person is to take the time and read the articles various lawyers have published explaining their take on these matters, and then call around. When you do pick up the phone, an if your charge is in any court in Macomb, Oakland or Wayne County, make sure you call my office, as well. We’re here to help, Monday through Friday, from 8:30 am to 5:00 pm, and can be reached at 586-465-1980.